WASHINGTON? A blue ribbon panel tasked with reviewing?NASA?s manned spaceflight programdelivered to the White House Tuesday a 12-page summary of its findings,including two options based closely on the space agency?s current plan forreplacing its aging space shuttle fleet. The panel,led by retired Lockheed Martin chief Norman Augustine, will not release itsfull report until later in September. But of the five basic options outlined inthe summary, two would continue with the Constellationprogram, under which NASA is developing the Orion Crew Exploration Vehicleand Ares I launcher to replace the space shuttle along with an Ares Vheavy-lift rocket and other systems that would enable the agency to returnastronauts to the Moon. Four of theoptions would delay the retirement of the space shuttle from the end of 2010 ascurrently planned to some time in 2011; the other would extend that program outto 2015. The first,or baseline, option would continueConstellation under U.S. President Barack Obama?s current five-year budgetprofile for NASA. Under this scheme U.S. involvement in the international spacestation would end in 2016. However, this option does not fund shuttleoperations into 2011; nor does it fund the scuttling of the space station.Orion and Ares I would not be available before 2016. Ares V, meanwhile, wouldnot become available until the late 2020s, and the Altair lander and otherlunar-surface exploration systems would not be ready until ?well into the2030s, if ever,? the report summary states. A secondoption that also fits within the current budget profile would extend the spacestation to 2020 and start work on a smaller version of the cargo-carrying Ares V.?This option also would fund a technology development program and pursue acommercial crew capability to deliver astronauts to and from low Earth orbit.It does not deliver a heavy-lift launch capability until the late 2020s, anddoes not include funds to develop the other systems needed to land on theMoon. Theremaining three options assume NASA?s funding profile for space explorationprograms increases steadily over the next five years to $3 billion higher thancurrently envisioned in 2014. After that, it would be allowed to grow at therate of inflation, estimated at 2.4 percent. The firstof these higher-budget options ? the third option overall ? would stick withthe current plan for Constellation but require NASA to budget for de-orbitingthe space station in 2016 and shuttle operations into 2011. It would continue developingOrion, Ares I and Ares V, with a maiden voyage for the crew capsule and itslauncher by 2017 and lunar exploration by the mid-2020s. A fourthoption, dubbed ?Moon First,? would extend the space station to 2020, fundtechnology advancement and rely on commercial vehicles to carry crews to lowEarth orbit. Two variants of this option are included, the first of which wouldretire the shuttle in 2011 and develop a lighter version of the Ares V. Asecond variant would extend the space shuttle to 2015 to eliminate the gap inU.S. human spaceflight capability expected when the space shuttle fleet retiresnext year as currently planned. It also develops a heavy-lift rocket closelybased on the shuttle for missions to the Moon. Both variants of the fourthoption deliver astronauts to the Moon by the mid-2020s. A fifth andfinal option, dubbed ?Flexible Path,? would begin exploration beyond low Earthorbit in the early 2020s, with lunar fly-bys, visits to Lagrange points andnear Earth objects, and Mars fly-bys. These events would occur at a rate ofabout one per year, according to the document, with a possible rendezvous withthe moons of Mars or a human lunar return by the mid to late 2020s. Develop a lighter version of the Ares V, which the summary describes as ?the most capable of the heavy-lift vehicles in this option.? Develop a heavy-lift rocket based on the U.S. Air Force?s existing Evolved Expendable Launch Vehicle. This option would dramatically reduce NASA?s role in launch vehicle development and operations. ?It has an advantage of potentially lower operational costs, but requires significant restructuring of NASA,? the report summary states. Develop a directly shuttle-derived, heavy-lift vehicle that takes maximum advantage of existing infrastructure, facilities and production capabilities. Of the fivemain options detailed in the summary, only the first and third do not featuresome level of outsourcing of astronaut transport to and from low Earth orbit toentrepreneurial space firms. ?Commercialservices to deliver crew to low-Earth orbit are within reach,? the documentstates. ?While this presents some risk, it could provide an earlier capabilityat lower initial and lifecycle costs than government could achieve. A newcompetition with adequate incentives should be open to all U.S. aerospacecompanies.? Thedocument also states that giving responsibility for space transportation to theprivate sector would allow NASA to focus on more challenging roles, ?includinghuman exploration beyond low Earth orbit, based on the continued development ofthe current or modified Orion spacecraft.? Elon Musk,president of Hawthorne, Calif.-based Space Exploration Technologies, said in aSept. 8 teleconference with reporters that his company could have a commercialcrew transportation capability ready within three years of a contract award. Hesaid the cost of transporting astronauts to low Earth orbit would run about $20million per seat, assuming four flights a year on the planned seven-passengerDragon. ?That?sabout 40 percent of the Russian cost,? 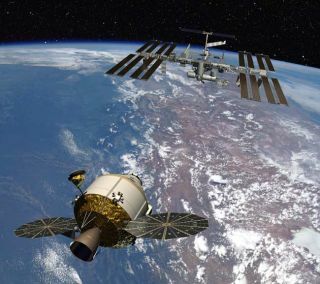 he said, referring to the estimated $50million cost-per-seat to fly U.S. astronauts on the Russian Soyuz capsule.Under NASA?s current plan, Soyuz will be the only means of transporting crewsto and from the space station following the shuttle?s retirement until Orionbegins operations.